Asics’s latest version of their popular DS Trainer series is the DS Trainer 18. The ABQ Running Shop sent me a pair to test out. When I laced these shoes up I noticed two things right away. The most significant thing Asics did was get rid of the ill conceived Clutch Collar that they introduced in the DS 16’s. They added a Heel Clutching System in the exoskeleton of this shoe. The second thing is the shoe laces are longer, long enough to double knot on my high volume feet. Several things carry over with this shoe from previous models. 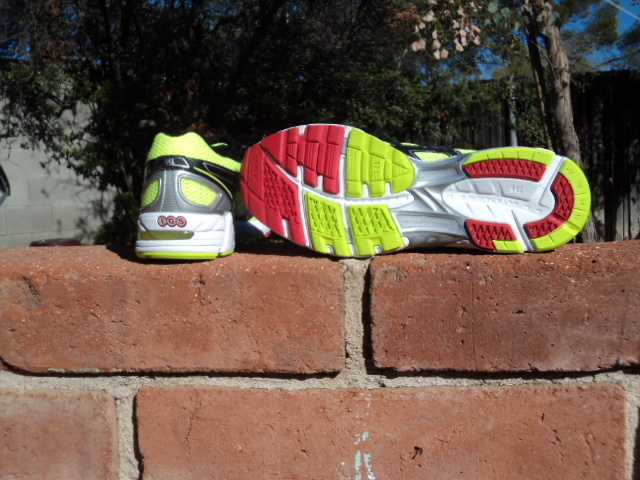 Asics brought the fore and rear foot gel pads and their Impact Guidance System (IGS) over. The DuoMax Support System which is their dual density mid sole comes along for the ride from the 17’s. 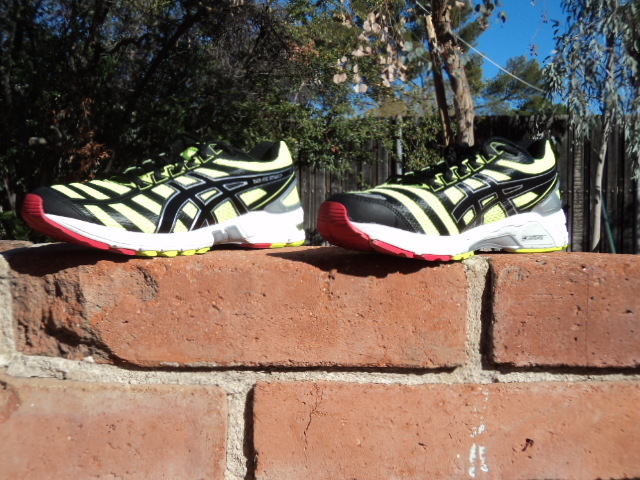 Asics also incorporated the Propulsion Trusstic system and Guidance Line in the DS 18’s sole as well as their SoLyte Midsole Material in it. This shoe loses just over an ounce from the DS 17’s. Something that is noticeable right off the bat when you run in this shoe. What’s new is seamless uppers and the Wet Grip Outsole. 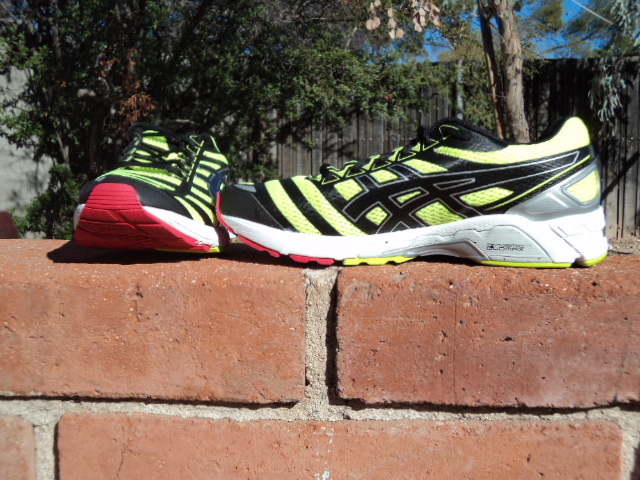 Many shoes in the lightweight category have gone to seamless uppers giving them a leg up on Asics. This neutralizes that advantage. The Wet Grip out sole though may not be a better thing. I didn’t get to run in the rain in Tucson in this shoe to see how it fared compared to the 17’s but I did make sure to run through some puddles when I was in Asheville. I can’t say for certain the Wet Grip outsole is a step up in wet conditions but it’s a step backward on the type of trails I run daily. This shoe lacks grip on the loose layer of sand and tiny rocks on top of the hard packed dirt trails that I run. It’s lack of grip is so noticeable that I took it out of the rotation when I run on the Rillito River path. If you run on something similar there are better shoes out there for traction and grip. When you run in this shoe you notice a few things. It’s lighter. It rides lower to the ground, not much lower, but it’s noticeable and welcomed. It’s softer. Softer in a good way. 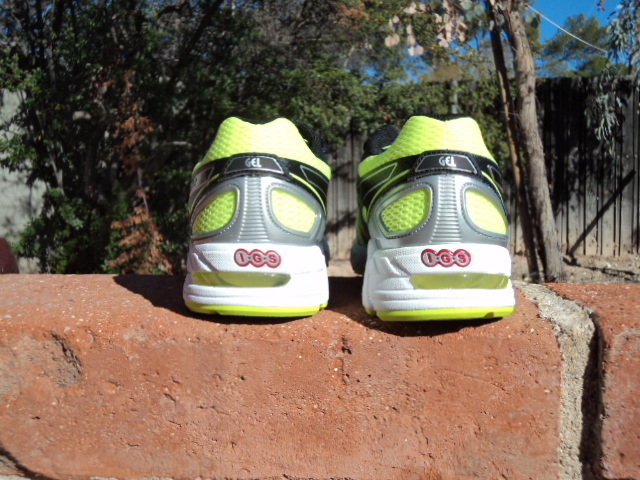 The DS 18’s possess the awesome Asics ride that you are used to. The transition from landing to toe off is smooth and predictable. When you want to run fast this shoe will go fast with you and you won’t have to think about your shoe choice. I found this shoe to be more comfortable after running four days alternating between the DS 17’s and 18’s. I see this shoe as being a great shoe for going to the track, doing tempo or threshold runs or even long runs with fast main sets. This would be an awesome shoe for long course triathlon especially the ironman distance. I’d put it in my top two or three choices for half’s. There is another Asics shoe I’ll be reviewing that I think may be a better half ironman racing shoe if you like certain things from your racing shoes. If you need unparalleled traction on trails, the Asics DS 18’s aren’t your shoe. As a day in day out runner the DS 18’s are a great choice to meet your needs. Comfortable, fast, light, everything you want when it’s time to go fast.